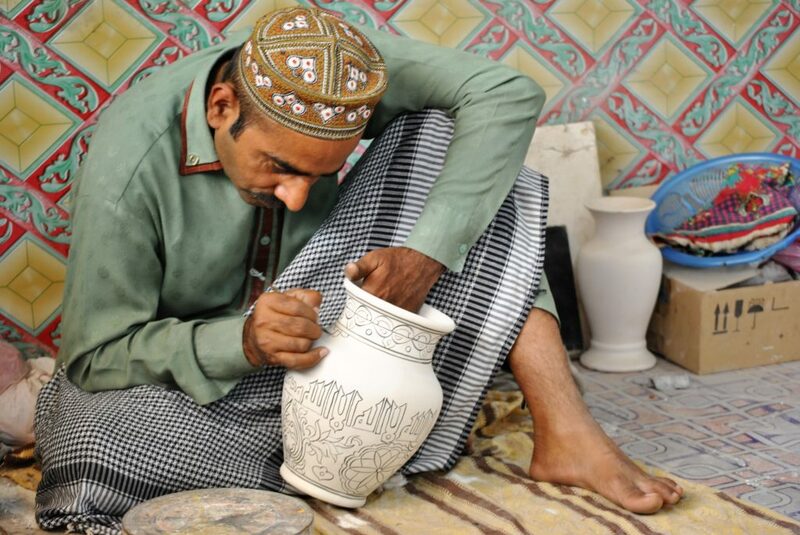 Kashigari is the art of hand painting and glazing of ceramic products, Multan is famous all over the world for this craft. 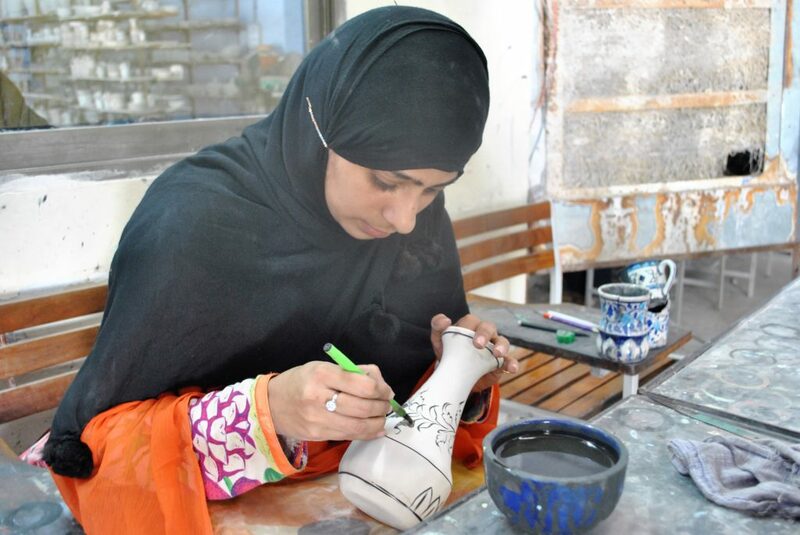 Located in the suburbs of Multan, about 10 km from the main city at Bahawalpur road, Ustad Alam Institute of Blue Pottery is a place where the art of Kashigari is being exercised on an industrial scale. Expanded over vast premises the center is, in fact, a factory equipped with modern machines for stone grinding, ceramic moulding, painting and firing. The place provides on the job training opportunity to learn pottery and Kashigari. 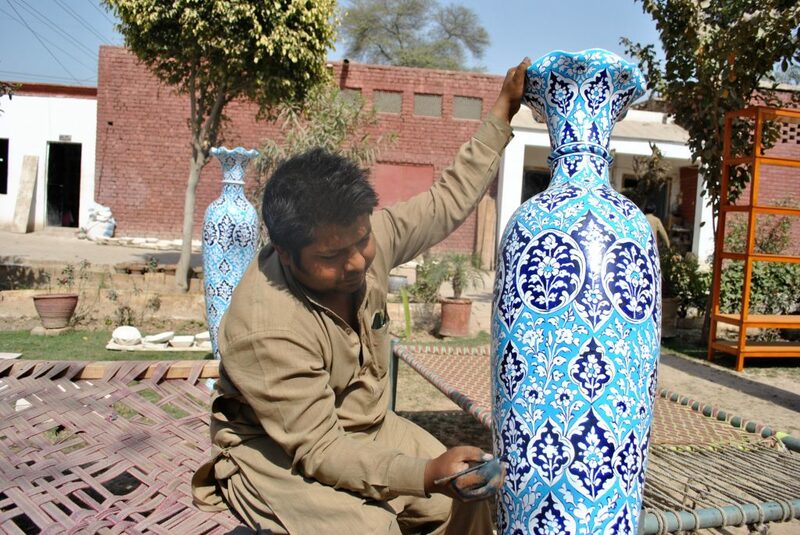 Ustad Alam Institute of Blue Pottery Development is the second institute of its kind in Multan, dedicated for the learning of the craft. Although critics say these large scale factories have captured the market from individual craftsmen. 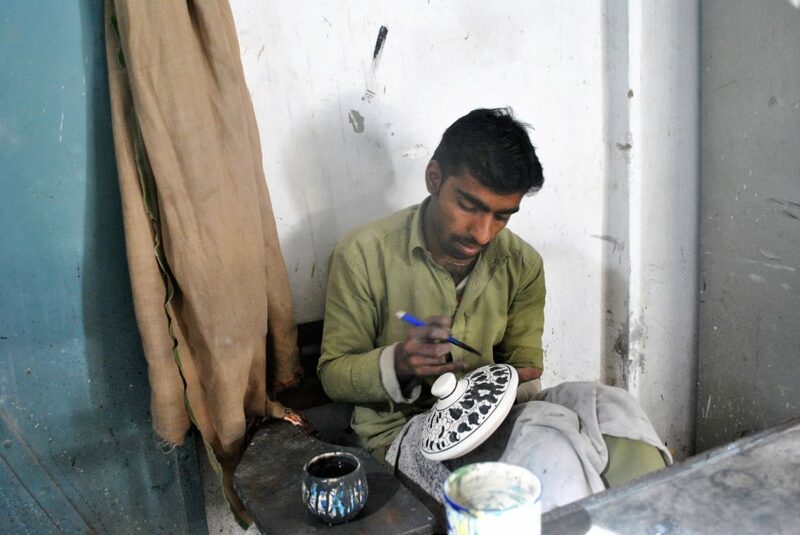 The institute is owned by Ustad Muhammad Alam, the acclaimed artisan of Kashigari. He has a career of over 60 years in the craft and has bagged many prizes including Presidential Award and UNESCO award. This humble artist who is the best judge of the worth of his craft still considers himself as a learner of Kashigari. The story goes that the craft originated from Kashgar, in the Xinjiang region in China, from there it went to Iran and then to Multan and some other cities of India. Iranians though have great masters of this art but the Multanis deserve accolades for advancing the work of craft. 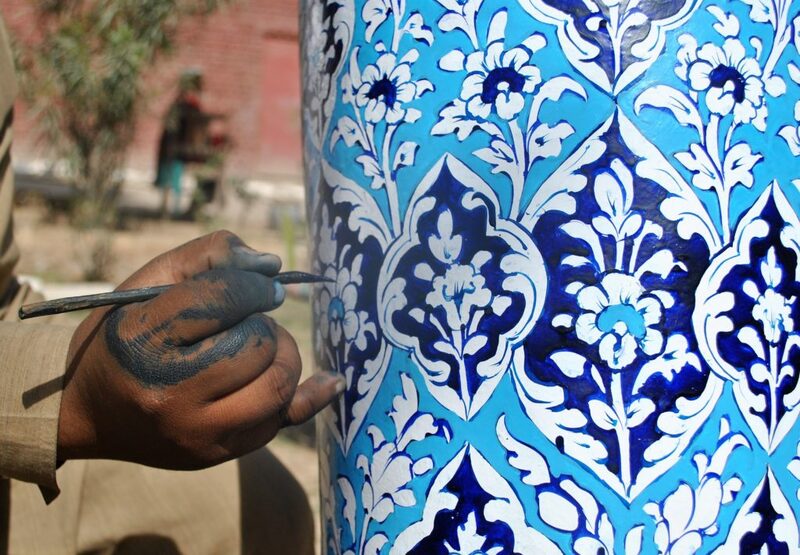 The art originated in Kashgar but Multan played a pivotal role in the development of this art. However, the contribution of Kashigars of Multan has not received the appreciation they deserve. Ustad Alam is a proud pupil of Mian Allah Wasaya who was one from the league of great Kashigar artisans of Multan including Mian Rahim Bux and Ustad Allah Diaya. 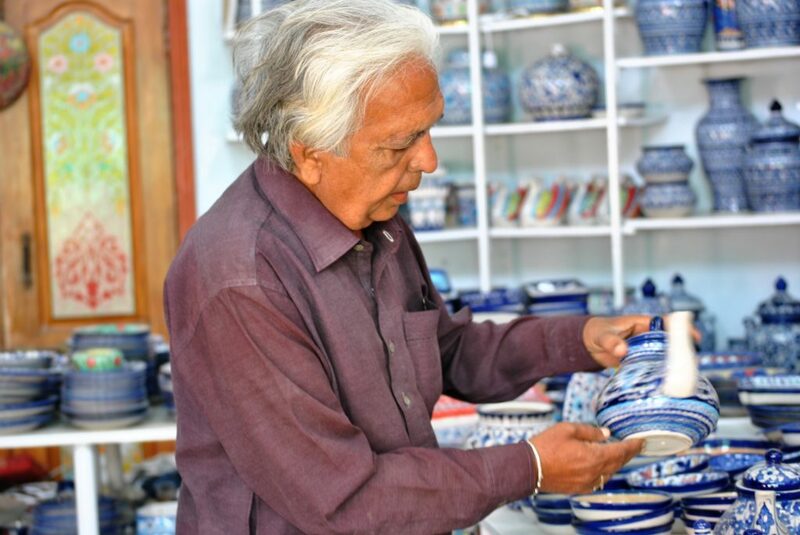 While talking about the phases of blue pottery Ustad Alam told the craft has gone through a major transition in recent times as ceramics is being used instead of its traditional material: the red clay. The reason for this modification, he told, is water pollution. For delicate work of Kashigari, craftsmen use a very delicate brush made of the hair from the tail of a squirrel. 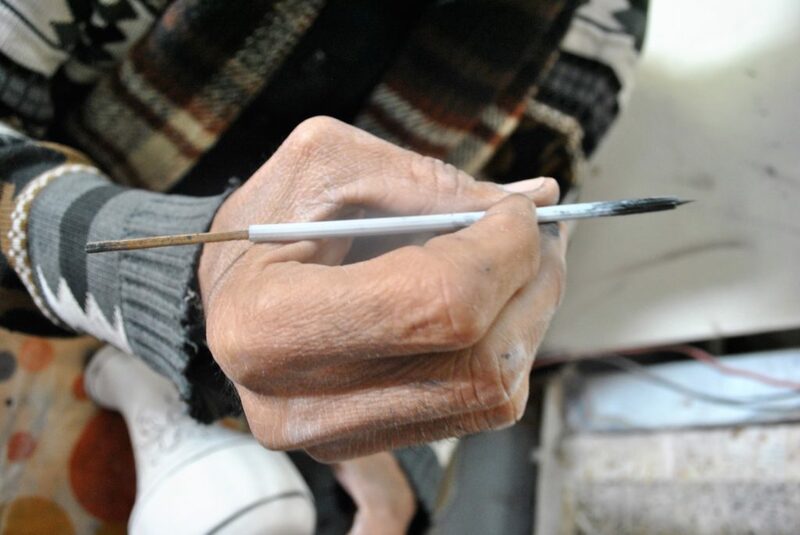 Kashigar Muhammad Shafiq told that five brushes are made from one tail and a brush runs only a week. 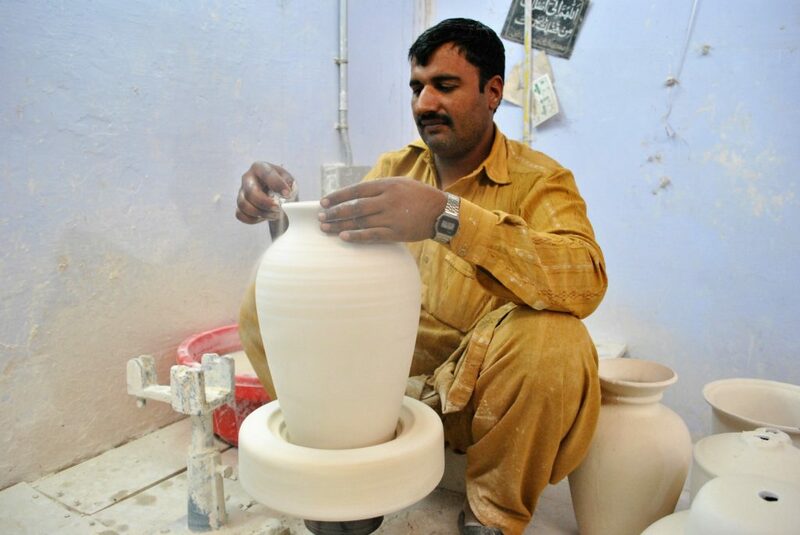 According to him, the clay used for blue pottery was taken from the middle of Indus River. It was the best material to make delicate pots but with increasing pollution in water, the clay got some unsuitable ingredients due to which making a fragile pot from that was not possible. Ustad Alam is world renowned artists of Kashigari who has set records in this art and won many national and international prizes. 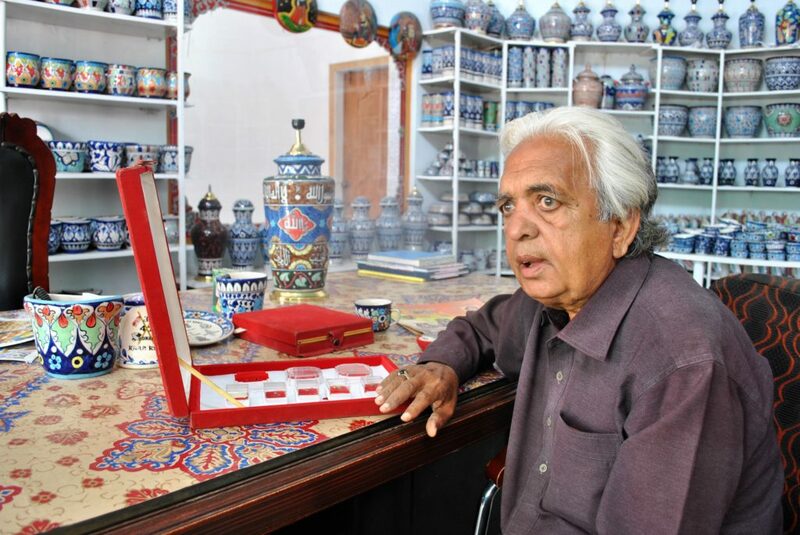 Ustad Alam recalls that time with great concern when the craft of decorated pottery was on verge of extinction. About 30 years ago, it was him who came up with a novel solution to use ceramics for blue pottery. The experience proved successful and saved the craft from its total disappearance. 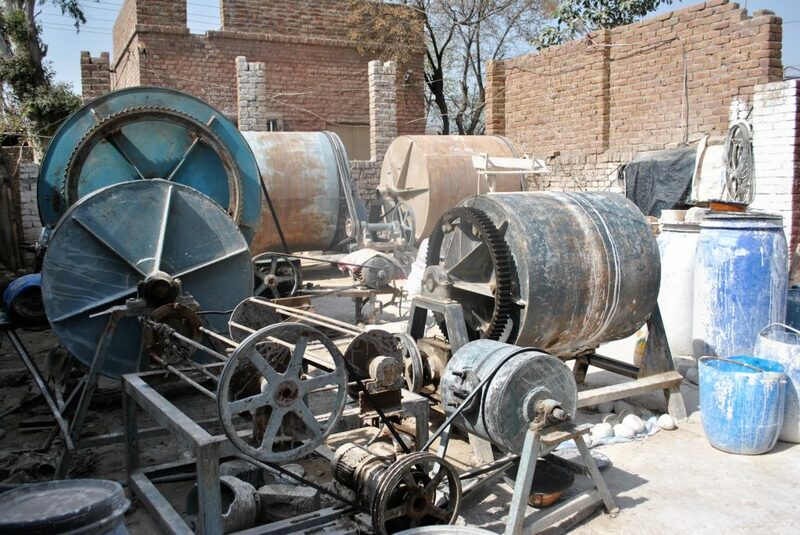 With the advancement of technology, the process of making blue pottery has undergone many changes, for example, techniques of grinding raw material etc. 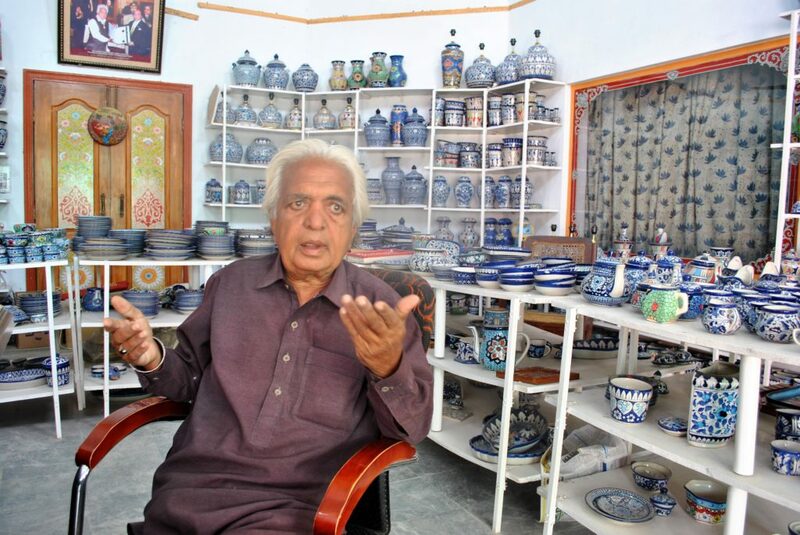 Other than Ustad Alam’s institute there is also an Institute of Blue Pottery Development in Multan run by TEVTA. At this place 3 and 6 months courses are taught on different techniques of blue pottery and Kashigari but the number of students there is only a few. The institute is depending on its outdated machinery and natural gas connection of its furnaces is disconnected since long. Some of these renderings are inspired from the flora and fauna of Southern Punjab. 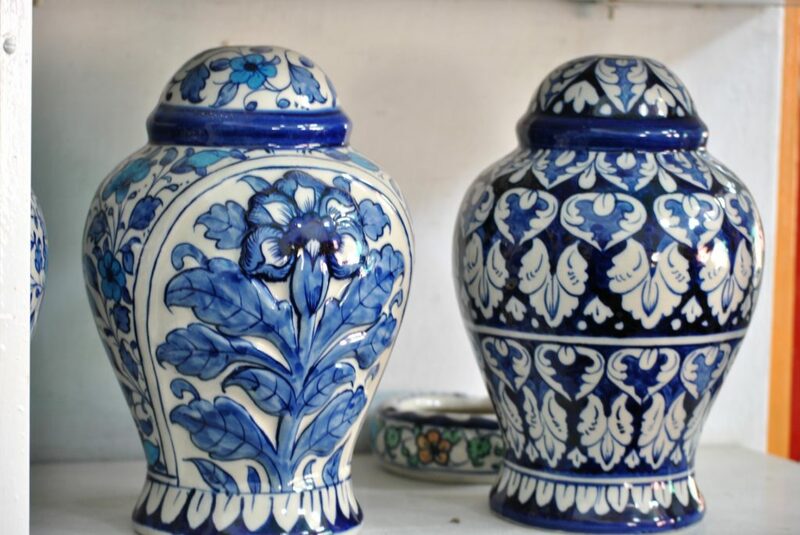 Both these institutes are established with the said objective to develop the traditional crafts of blue pottery and Kashigari, however, some craftsmen complain that these institutes have become commercial factories of glazed and painted pots rather than institutions for the development of craftsmanship. Previously the local clay was used to make pottery but due to increased water pollution in the river that material became useless and ceramics was experienced which proved successful. Backed by the governmental support and large resources these institutions are producing at mechanical speed and quantity but an ordinary artisan can’t compete with them in prices although the quality of work of these artisans is far better than these factories. These factories employ artisans on nominal wages and sell their master pieces at exorbitant prices. 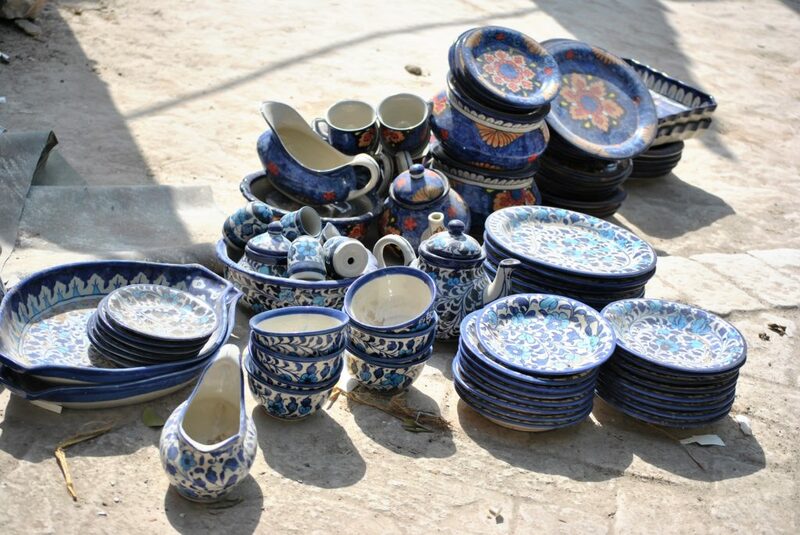 Blue pottery or Kashigari is integral part of Multan’s traditional crafts and has a historical and cultural significance for the City of Saints. The artisans demand that government should support them with low cost material and help them to set up their own furnaces. Otherwise, very soon the craft of blue pottery and Kashigari would be engulfed by large industrial units and poor artisans would have only their place as wagers there. The motifs and compositions can be found in various techniques and either prepared with fine lines or with broader lines. The traditional craft work demanding the attention of the government for its preservation. 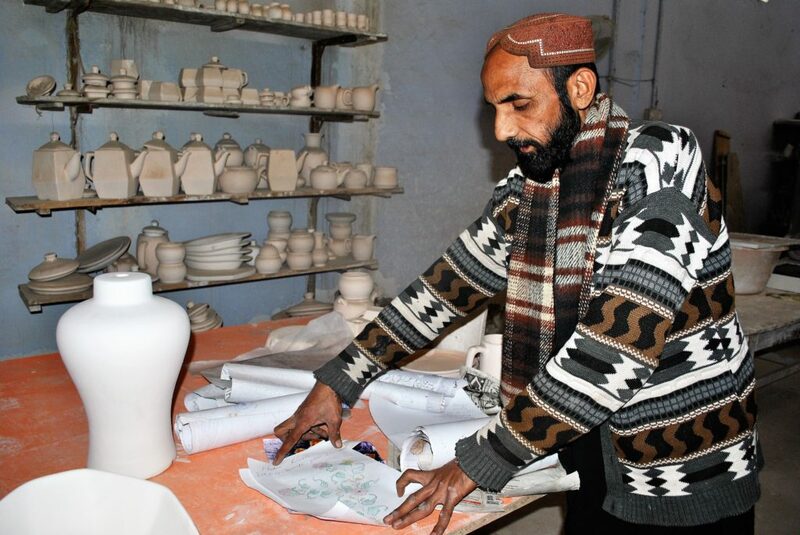 Many of innovative techniques are brought by Ustad Muhammad Alam to the craft of Kashigari or blue pottery, including shifting it to ceramics which gave new life to this craft. Muhammad Shafiq Kashigar displaying his designs. To his credit, he has created hundreds of designs of its own. 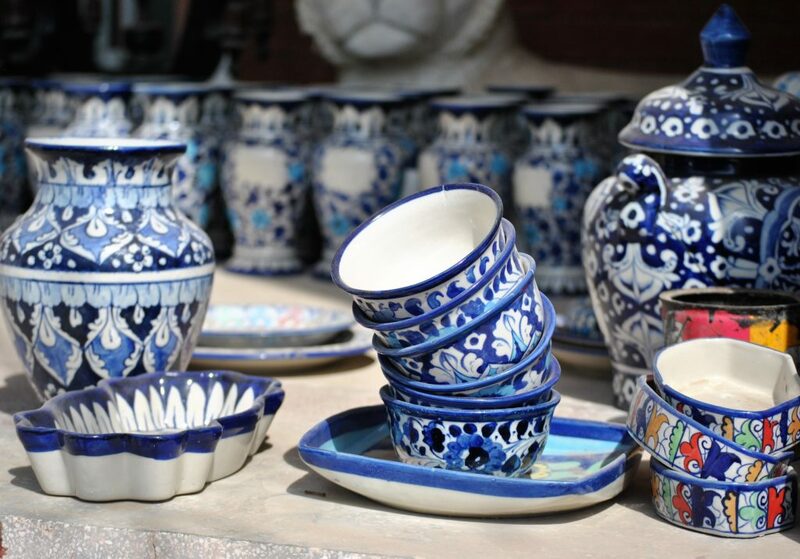 Blue pottery, Multan’s rich heritage craft can find big market with government’s patronage, national and international exhibitions and promotional activities. About Author: Aown Ali is a Lahore based photojournalist with interest in culture, architecture and history.